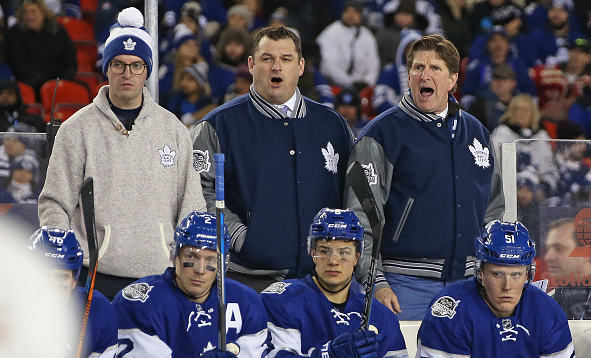 When he first took over the Toronto Maple Leafs in 2015, Mike Babcock seemed to have an impossible task on his hands. The Leafs were a team going nowhere fast. Despite the continually packed ACC each week, there seemed to be an apathy in the air. Previously, Babcock had turned Detroit into a well-oiled playoff machine and many questioned his logic taking this job. After Saturday’s dramatic 5-3 win over Pittsburgh, this franchise enters the postseason for the first time in nearly 5 years. Getting to this point was no easy task. Babcock’s record with the Maple Leafs this season was a solid 40-27-15 which squeaked the last wild-card spot by a single point. There is no question that Babcock deserves to be on the Jack Adam’s shortlist. However, has he done enough to earn the big prize? Even getting the Leafs this far was a remarkable effort- especially since they were locked in a close race with Boston and Tampa Bay. After Sidney Crosby scored Pittsburgh’s third- many thought it was game over! The spirit and strength Toronto showed to rally back was phenomenal. The real strength of Babcock’s coaching has been his handling of his young talent. Auston Matthews has more than lived up to the hype. Putting up better rookie number’s than Sid the Kid, this guy already looks like a franchise leader. Their coach showed trust in him and despite a hit and miss start- Matthews along with Mitch Marner and William Nylander are taking the Leafs into an exciting new era. More than anything, there appears to be a new strength of character. The Toronto teams of old just looked like a group of overpaid pros struggling to hit their weight. Trading Phil Kessel limited them offensively at first, but Lou Lamoriello and Babcock both had faith in what they were doing. Finally, each line has a key character who gives the lift. Trading for Brian Boyle at the trade deadline was a smart piece of business because his experience gave balance to a talented side. Scoring goals was a problem was finally solved, Toronto 5th overall in Goals For By Strength. They also let in a whopping 234 goals against which has a few alarm bells ringing. Babcock also turned this team into a great power play unit. Currently ranked second overall, their powerplay percentage was a remarkable 23.8%. Finally, this team seems to know exactly what they’re doing. MB has rallied them together well and right now they are riding the wave. When it comes to the race for the coach of the year award, the Jack Adams Trophy, Babcock will not be the clear favourite for this award. Just look at the job John Tortorella has done in Columbus. Toronto has a number one pick and several young prodigies, what did the Jackets have? Also, not out of the running is Bruce Boudreau in Minnesota- who returned the Wild to playoffs. This is one decision that is going to inspire a lot of debate. Babcock has done a magnificent job, but will having more resources be held against him? Tortorella might not be everyone’s favourite person but it cannot be denied that he has created a deadly side out of limited resources. Another question that needs addressing is whether this form will last? Drawing Washington in the playoffs was the worst possible result. Many Leafs fans prayed for a victory in their rubber match against Columbus. Now they face a red-hot Ovechkin side who will be looking to impress. Having a seasoned coach like Babcock will help – he has a 2008 cup ring to prove that. After so many false dawns, Leaf fans will be keen to at least get a decent run to show they deserve a place among the elite. Does Babcock deserve the Jack Adams? On spirit alone he would win by a landslide. He has kickstarted belief in Toronto again and the fans love it. However, they have to also contend with the fact that other coaches have better records. He is deserving of this honour- but expect a close race for this award.